When planning your Low Voltage lighting design for your path or driveway, the hanging fixture will give you added curb appeal with very little added work. The Low Voltage Outdoor Light Fixture will use very little power and can be added to an existing wire run or you can make a “T” off of an existing wire run, see more information on wire runs here. All of these fixtures will be powered by 12 volts and will need a transformer and wire run to make them work, see the end of this article on more information on installation of your fixtures. We will look at five different designs and compare them, any questions or comments use the form below this article. 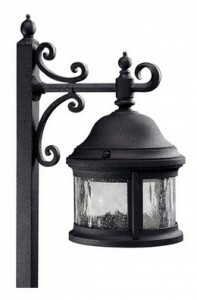 This lantern style is made from die-cast aluminum. The stake with a scrolled arm will support the light fixture that has a fluted dome housing and clear hammered glass diffuser. Illumination will come from a single 18 watt T5 wedge base bulb. The two piece stake will be 25 inches high and the globe is 5 3/4 inches across. The stake will be connected together with a screw connection and srew into the ground stake. You will get 72 inches of cable and a connector to connect to your wire run. See below on what you will need to make this fixture work. For this style of fixture you can get an outdoor wall, chain hung and post top Mounting fixtures to match. 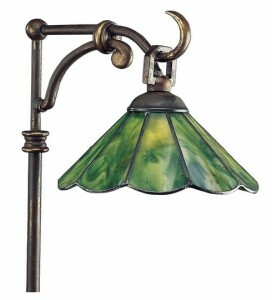 The post on this fixture has an antique bronze finish with a curved arm for hanging the light fixture. The hanging Tiffany Art Glass Globe has a sculptured bottom and looks like stained glass. This will bring a art deco feeling to your outdoor space. The illumination comes fro a single 18 watt T5 wedge based bulb. The post is made of brass with screw together fittings for a secure fit. A 36 inch lead wire and 8651-31R connector will allow you to connect to your existing low voltage wire run. This fixture is approved for wet locations if you use the included connector. The globe is 7 inches across while the post is 23 inches tall. This die cast aluminum fixture has solid brass interior parts. The exterior is painted with a black powder coated finish that will last a long time. The globe has water seeded glass panels that can be removed for cleaning. The illumination will be done by one 18 watt halogen T5 wedge base bulb. Globe will be 6 1/2 inches across and the fixture will be 26 inches tall. Post will be assembled by threaded connections to a secure fit. A 36 inch lead wire is included to secure to your wire run with the included 8651-31R wire connector. If you use this connector the fixture is rated for wet locations. Other fixtures of the same style are available to include-wall mount, chain hanging, post mounting. This simple Solid brass and copper fixture will have a Sienna bronze finish with a honey art mica glass globe. The post will have two leaves on the back. The illumination will come from a single T5 18 watt wedge base bulb. It will be 9 1/2 inches wide and 22 inches tall with a 9 inch ground stake. The fixture comes with a 36 inch lead wire to connect to your wire run. It is rated for wet locations if you use the included wire connector. Matching Hinkley Aspen outdoor lanterns are available. The Ivy fixture by Hinkley will have a copper bronze finish on the metal parts. The globe will be a light Amber color that is sandblasted on the inside to give it the frosted look. The fixture will take a 18 watt Xenon halogen T5 wedge base bulb. Your fixture will be 26 inches tall, with some of this in the ground and the globe is about 8 inches across. Where do I find more information on one of these Fixtures? If you have an existing wire run for a 12 volt low voltage system close to the new fixture, just use the included wire connector and make sure that you have not over loaded your transformer. If this is an new installation I have several other post that will help you get the proper Transformer, Wire and Wire layout for your outdoor space. Just follow these links- Transformer– Wire and Wire Layout. If your fixture does not have the connectors follow this link. These are some great examples on how you can decorate your outdoor space and get lighting at the same time. The Low Voltage Outdoor Light Fixture will look great in the day time and after dark will let you navigate your outdoor area with ease. Several items that some customers have had concerns are the post being fragile and fixture being too top heavy. Several used rebar or heavy wire rods to make the stake a little more sturdy. I hope that you found some valuable information in this post, if you have any questions or comments use the form below. I love your post on outdoor lighting ideas. You have inspired me to look at some lighting for my front walkway. I like your suggestions better than the cheap looking solar lights that you can line your walkway. Do you find setting up the electrical sources difficult? Something I’ll have to do after winter! Just follow instructions I have on several post on what you will need and how to layout your lights. If you purchase an entire set you just need to use what is supplied, if you buy just the fixture you will have to calculate what kind of transformer you will need. The designs you selected to review and compare I thought were great choices. My favorite I think would be the Progress Lighting P5250 Ashmore, because of it’s Victorian era gas lamp feel to it plus the powder-coated outer. Would you think this coating would protect from the hot sun as well as the rain? The items that are powder coated last a long time in the rain and outside elements. Powder coating is a dry spray that is baked into the surface that it is applied to. It produces a hard finish and does not tend to peal off like a regular spray paint will. The low voltage outdoor fixtures look good. I must admit that your posts are always eye opening to me. If I may ask, how wide is the area they on average light up? Do they need to be several to cover an average driveway? Are they sold in units or in a set of several? These fixture will cover about 10 feet from the light all around. Since they use almost all the same bulbs, they will cover what the globe will allow. If you put them about six to seven feet apart you should be able to cover the whole driveway. These are only sold one at a time, no sets. As a former home renovation / construction dude myself, I am truly proud of you and your site! Well Lit and cozy spaces! Great ideas! Your site is easy to navigate and very helpful! Like one of your other visitors already commented, beats the heck out of cheap solar lights! Gives me some ideas on redoing our back yard. Well Done! Light up the World! Thanks for the comments, there is a place for solar lights. I would only put them in isolated places where 110 volt electric is not available. I can put individual links to products. Some people did not like it. Putting these lights in a garden area would make for a great idea. I love the outdoors! But for some reason I have never thought about making a room outdoors. I love that you have everything you need to make a great room outside on your website. Even if people just want to add furniture to their back yard, this would be a great site to visit. I also love the layout and design. Keep up the great work! The only thing I would suggest is to add a little more furniture to the site. Thanks for the comments. What kind of furniture are you looking for? Dining or casual. I will look into both of these and post new selections in the next few weeks, come back and see what I can offer. Without a doubt, the hanging style outdoor lamps give much more of a touch of class to a year than the lower to the ground styled lights. I like all the varieties that you’ve posted, but if I were to be backed into a corner, I’d opt to go with the first one – Progress Lighting P5275 Coventry model. It seems to be the best fit for the decor I’d want to choose for the front yard. Thanks for the resources, and all the best! 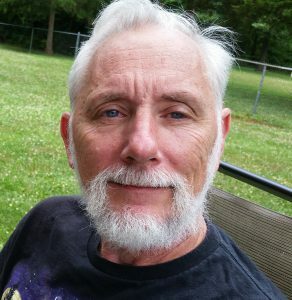 Thanks for looking and choosing a style. These are on the upper end of lights for you outdoor space and will add plenty of light to your garden or patio area. Great post John and coming into the winter it’s definitely something I was thinking of investing in with the dark nights coming the front of my home needs some work but this would make a great improvement to it! The layout of your site is fantastic too and you notice it the second you’re on it! With the longer nights without sun during the winter, Solar lights do not stay on all night. The low voltage lights will be a better value if you live in a northern area with a longer winter. These are a great investment on the entrance to the home, as they will make coming home after dark safer for everyone. 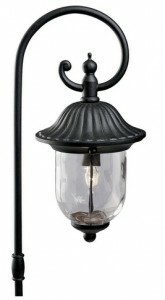 Nice selection for the outdoor lighting that you have posted for using in pathways or along the driveway. I also like the fact that you have other go to posts for the actual information required for getting them operational with the required wiring. This is something that I could really use with how my yard is and now would be the time to start planning before I do any landscaping to get everything mapped out. I am going to work on getting some detailed plans for a new post coming up before spring. This will help those who are planning the layout of their Low voltage lights. This is something any do it yourselfer can do with many tools. I love idea of outdoor lightening. This brings some whole new dimension for your path or road. In front of my house I have something similar like progress lighting P5275 Coventry. I just love that classic look. Return me in the old retro style. Great post. Thanks for the comments, the classic look is in today. These type of fixtures fit in many decors today, you do not have to have a old Victorian house to have an old look. Even the more modern house designs look goo with the old retro style lighting. Hi there! i enjoyed reading your site and want to now go buy some outdoor light fixtures! The site is clean and easy on the eyes. I was able to navigate each page and not get lost in distractions. The colors you chose are very pleasing to the eye and the theme works great for your niche! Great work! Thanks for your comments on my site. I am glad that you have made a choice of Outdoor light fixtures from the information that I have provided. Your post contains very valuable information on how to decorate an outdoor space and get lighting at the same time. The selection of lamps you provide and the explanation of each are very comprehensive. My mother always is in the lookout for new decoration stuff for her patio. I am going to send a link of your page to her since she has mention she wanted to add lighting to the outdoor area. Thank you for sharing! There are many different solutions to each persons outside lighting needs. If your mother does not find what she is looking for, have her drop me a line and I can map something out for her. I love how these outdoor lighting ideas look rather classy and elegant, especially the Ashmore one. How much electrical knowledge is required to install these outdoor to light up my driveway and pathway? or do you advise hiring a tradesman to do the job? Also can these be installed “into the ground” set in concrete as I do fear someone stealing them as they do look awesome! These are Low Voltage style lights. They require a Transformer and wire run. These both can be done by anyone. You can set in concrete to keep someone from walking off with them, connect the wire first. A lot of installations of this type of fixture is on an existing wire run. Just have to make sure that the wattage of the transformer is not exceeded.